See, when I was little I decided to become an archaeologist after my teacher told me that one of the Egyptian pharoahs was actually a woman. A real ball-breaker. 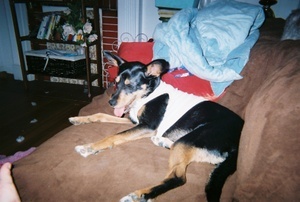 She even cross-dressed. Even to a little kid it seemed so subversive and wonderful: A woman? Leader of a whole entire country? Shut your mouth. So the little third-grade geek's heart leapt this morning when I read about how they've found her mummy. I like the part about how they had to hide her body to keep her douchebag nephew from desecrating it. 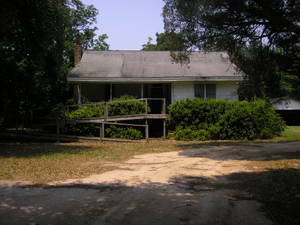 This past weekend I went down to South Carolina to pick up some crap I'd been storing at my parents' since Christmas. It was a productive weekend--not in the sense of anything I accomplished, but of things I SCORED. Whilst rooting around in the attic (only your mom will root around in a hot, dusty, spidery attic looking for your She-Ra castle because you're too weirded out to go up there), Mom discovered part of my Nancy Drew collection, lost for some time. 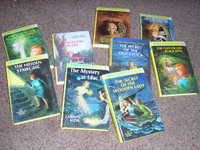 I brought some of them home with me but left a few for her to read, because she was into them as a kid too. Nancy Drew is getting UP there. 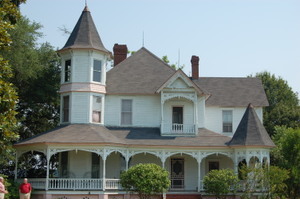 On Saturday we went to Darlington, S.C. to see Auntie Harriet and Uncle Lynn's Victorian farmhouse they bought. They have a lot of work to do on it, but it is still tres cool and fun to walk through. I hope it has a (friendly) ghost. 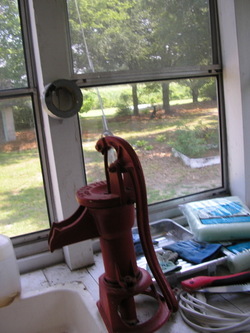 Even if there's not friendly ghost, there's definitely a friendly water pump. It's maybe my favorite thing in the whole house. 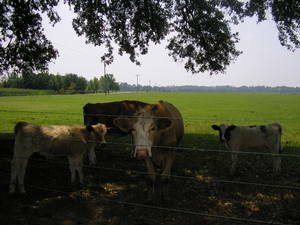 Cows in the field next door. They were all, "Dude, what?" "This is just one example of how the president puts ideology before science, politics before the needs of our families, just one more example of how out of touch with reality he and his party have become," Sen. Hillary Rodham Clinton, D-N.Y., told the Take Back America conference of liberal activists Wednesday. Does it seem like we've had the same president for about 20 years now? I'm just saying. It feels like a long time. I went antique malling on Saturday and scored, maybe the best antique mall score I've made. The mall was one of those ginormous ones that are 30% crap, 30% stuff you can't afford, 35% vintage Pepsi bottles, and 5% actual stuff you'd want. It took me two whole hours to go through the entire place. Right away I found this little precious. 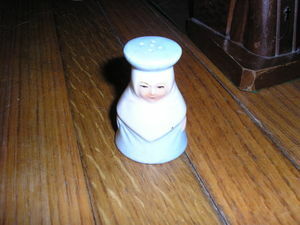 She's a nun salt shaker from Occupied Japan. She did not have a mate. :( Lonely nun lady. 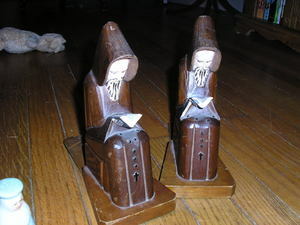 A few minutes later I came across the real score, a set of monk bookends. I passed on them at first, but when I'd made it to the end of the mall I was still thinking about them, so I re-searched the whole place for them. And got them for 40% off! Now that I've got them, I can't stop looking at/talking about them. And here's one of them on the shelf. 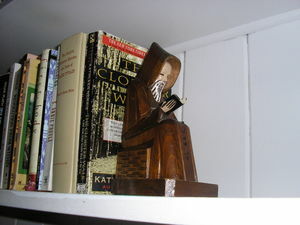 I put him next to a book about monks so he'd feel at home. 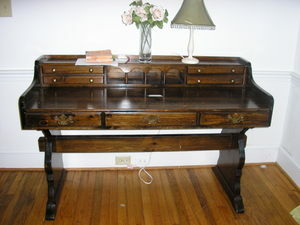 I keep meaning to put this up here...It's the desk I got at the Habitat for Humanity ReStore the other week. $35, man. $35. It was weird. I went in there on my lunch hour because it's right around the corner from my house, and ended up buying a desk. I had to call in to work that I'd have to stay home and wait for the delivery guy to bring it. Check out the cool mail slotty things in the middle (yes, "mail slotty" is a word. I declare it a word because I am a word professional). It's a little scratched up in the front, but I don't know if I care. If I do decide to care, I'm sure it is fixable. 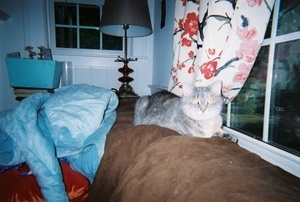 That's Weasel Cat there, being judgmental. 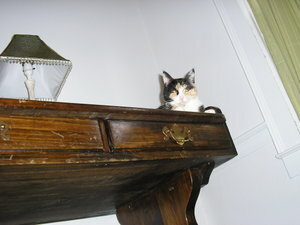 (Actually click on the photo to experience the utter derision...) The desk is her new favorite place to Be At All Times. 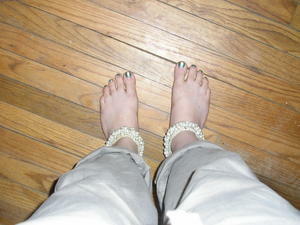 Here's a pic of my feet sporting my jingly anklets. I haven't worn them in a while because the subject of belly dance has been a sensitive subject for me lately. I ended up switching to a new class recently, after trying for a couple of sessions to get over whatever my problem with with my old instructor was. I thought for the longest time that it was me being oversensitive about certain things, but when I realized that I was leaving class in a bad mood every week but still wanting to learn, I decided it might not be just me. My new instructor is a much more Zen kind of lady, and I find her very easy to talk to and learn from. Plus she has a much more killer studio (no poles!!). So last night I put my jinglies on in celebration of leaving dance class in a good mood for two straight weeks. So Happy Flag Day--here's a picture of my feet. Found this on CafePress, and I NEED it (I've really got to have fewer shopping fantasies, I know). I showed it to my boss, who is from Massachussetts, and he said, "If you buy that, I totally give you permission to wear it at work!" In other news, something rare happened this weekend: I saw a movie in a theater and actually liked it. Waitress was a little long, and Keri Russell's Southern accent is iffy, but I really liked it. It has one of those endings that annoy you when you're still sitting there watching the credits, but then later you think, "No, that totally worked." Plus it was about pie. Can't argue with that. Right after seeing it I went to the store and got pie fixings and made a pie. And it turned out halfway well...in spite of this being a really crappy peach season. 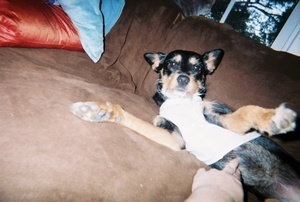 Minnie sports the muscle shirt her grandma sent her. I will post more from that photo shoot later. For the life of me I can't get a pic where the writing on the back of the shirt will show up. (Must be the lighting.) It says "Spoiled." Could you just die. Cool moundy thing from the Indian village I went to the other weekend. 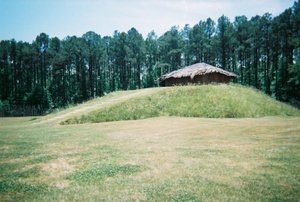 The building is a reconstruction I think, but the mound is legit. Too legit to quit, hey hey. It was the place where they had all their ceremonies and whatnot. I got an arrowhead in the gift shop. I don't know if *it* is legit, but it looks pretty dangerous. Mess you up.